Vagaries of the Weather ©: Bangalore gets freedom from seasonal deficit in just single day on our Independence Day ! Bangalore gets freedom from seasonal deficit in just single day on our Independence Day ! But Independence Day started with Massive Rains overnight so all the seasonal deficit got wiped out in just span of 3-4hrs Thunderstorm rain ! Bangalore HAL recorded 144 mms & Bangalore city 129 mms rainfall ending 8.30am today on 15-08-2017. Not only seasonal deficit got wiped out but Bangalore HAL Airport broken it's previous 103 mm highest rainfall record in 24 hrs for Aug month which was set on 12-08-1996 by setting new record of 144 mms in 24hrs today ! Also Blore city August total so far stands at 174mm till today against the normal 147mm ! So above of normal Aug avg in first half of month itself. The system that gave rain moved in from south past midnight. BTW heavy rains in Mysore and Mandya also yesterday. Mandya recorded nearly 144 mm owing to rain last evening. Much required. Imagine July GUJ kind of rains - every alternate to 2 days dump of 200-300mm !! Cherrapunji 6000 mm for monsoon and 9450 mm for the year 2017 till date. Unusually hot Delhi along with humidity-Feel good around 47 yesterday. Temp can cross 40 by Thursday. Yes,long wait for rains continue in Delhi.Days are hot and humid.DELHI began monsoon with bang but since beginning of july not much rainfall.ALL india rainfall may enter below normal. Sir, any chances of rain in Nashik? Abizer - I never meant that way. Meaning is KAR required heavy rains -Cauvery is dry. This is 1st heavy spell for BANG -city due to lack of infrastructure got into mess- but water is essential for atleast borewells to get recharged. Just 1 spell - city requires more rain - same with interiors for poor farmers. I meant how GUJ would have faced massive 3 digit rains every day? 87 mm, 22 mm and 9 mm. So 119 mm. For the year Gottigere is at 590 mm. The normal till Aug31 is 510 mm. So almost 15% excess. BTM LAYOUT is at 640 mm. Bilekehalli at 690 mm. 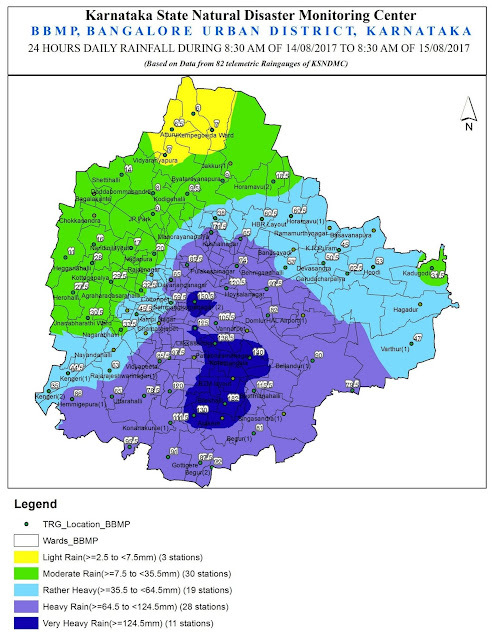 Whereas there are many areas in North bangalore at 400 mm to 430 mm. Seems like Mumbai will have wet ganesha celebrations on Aug25. Enjoy! Very critical situation in Marathwada region (Maharashtra) now. Very less rain in last 2 months. Not much relief from upcoming low. Because most of crops already damaged. 34 farmers committed suicide in last 7 days. Till this year 580 farmers committed suicide in marathwada 😔. Now people starts migrating to nearest cities for work. 2500 families of Paithan taluka (Aurangabad) already migrated. KINDLY PUT SOME LIGHT ON JABALPUR (EAST MP) WEATHER. THERE HAS BEEN HARDLY ANY RAIN HERE THIS SEASON. WE USE TO HAVE MORE THAN 55 INCH USUALLY BUT THIS TIME ITS NOT EVEN 25 YET. 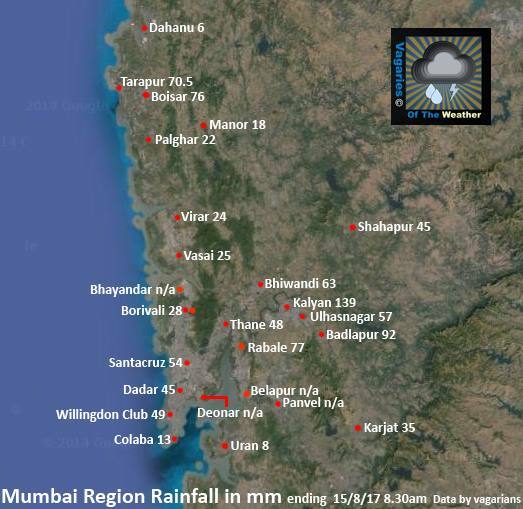 CAN WE EXPECT ANY THING FROM REMAINING MONSOON SEASON?